Teachers have one of the hardest and most important jobs in the world. They are often underappreciated for all the love, inspiration and care they provide for their students. As much as I love creating nice DIY gifts for my kids’ teachers, it can sometimes be very hard during the already busy season. 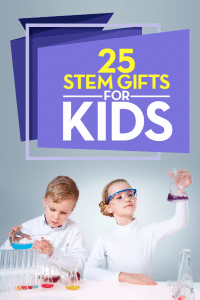 Fortunately, there are quite a few options for unique and affordable gifts for teachers. 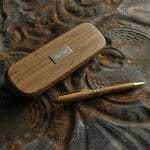 This attractive bamboo set includes a long lasting pen and a matching case. The case can be personalized with one line up to 15 characters to add a name or message. It’s a great gift if you’re looking for something original and extra special. 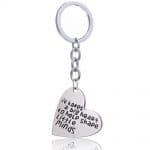 This sweet keychain pendant is a lovely gift for a teacher who is making a positive difference in the lives of her students. The message “it takes a big heart to help shape little minds” is engraved on a silver heart that teacher can take with her everywhere she goes. This pretty necklace and pendant is a great way for teachers to display their passion for teaching. In silver and with the words Teach, Love, Inspire engraved around an apple, this necklace is perfect for everyday wear in the classroom. 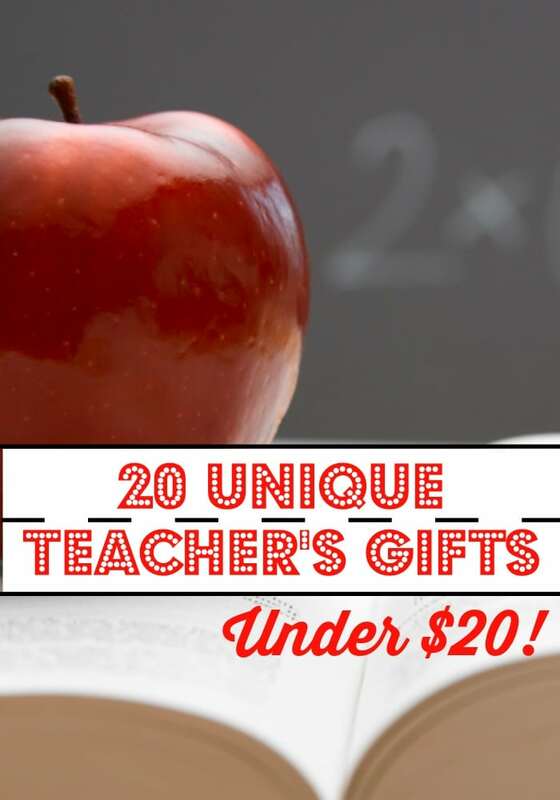 This one is a little over the $20 budget ($24.99), but such an adorable gift for your favorite teacher. With its white chalk on black chalkboard design, it’s a wonderful timepiece for teachers to keep on their walls at school or at home. 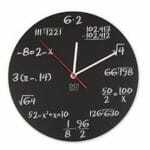 The Pop Quiz Clock is also the perfect chronogrammatic companion for any math geek’s wall. 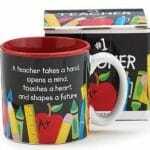 A #1 Teacher Mug is a must have gift for every teacher’s desk. Remind your child’s teacher with each sip of his or her favorite hot beverage that he or she is the best. 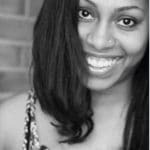 Teaching can be an emotionally and mentally taxing job. This inspirational book for teachers will help your child’s favorite teacher keep his reasons for teaching close in mind. Reading the stories of other teachers will help him on the toughest of days to remember why he chose to teach. 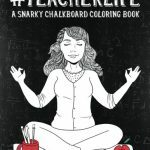 If your child’s teacher is more a fan of snark than inspiration, the #TeacherLife Snarky Coloring Book for Adults is a fun gift. If you think the teacher on your gift list will appreciate a little snark about the realities of teaching, this coloring book is perfect. The Teacher/Wisdom/Inspire bracelet is a beautiful way to show your appreciation to a special teacher. It comes with an inspirational message that is as lovely as the bracelet itself. If you happen to know your child’s teacher’s favorite sport’s team, this team throw pillow is truly a gift that’ll stand out from the rest. I don’t know a teacher who doesn’t take work home on occasion. This pretty personalized tote is a lovely way to carry important books and papers between school and home. 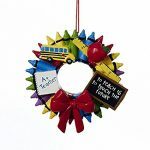 This crayon wreath ornament is an adorable way to show your child’s teacher how important she is. She will see it on her holiday tree for years to come and always remember the lives she’s touched. 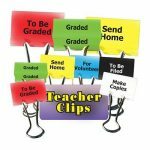 Here’s a teacher’s gift that is fun and practical. 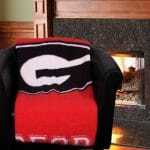 It dresses up an ordinary roll of tissue and can be used for years to come. 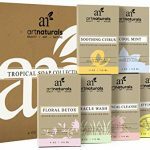 Show your appreciation and help your child’s favorite teacher relax and restore with this gift box of lovely natural soaps. If you have more than one teacher on your gift list this year, giving one or two soaps per teacher is a frugal gift idea, as well. Everyone uses essential oils these days. An essential oil diffuser is useful in the classroom or at home. Your child’s teacher can set the mood for the day by creating a calming or stimulating atmosphere with the touch of a button. This tea infuser bottle is not just for tea. It can be used for hot tea, cold brew coffee and fruit infused water. It’s great for a busy teacher because it travels well. It comes with a sleeve that is great for transporting the bottle between home and work. After a long day of bending over children’s desks to help with lessons, a teacher’s back and neck can feel stiff and sore. Give your child’s teacher the gift of a self-massage with this massage stick and muscle roller. 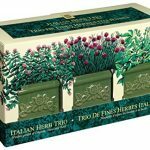 If the teacher on your gift list loves to cook from scratch in his spare time, this miniature Italian herb garden is a great gift idea. It can even be used in the classroom to teach children how to grow their own herbs. The air in a classroom can get a little stuffy sometimes, especially in the winter months. 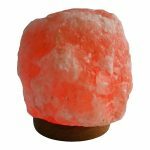 Give the gift of pure, clean air with this Himalayan salt lamp air purifier. 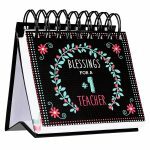 Make your child’s teacher smile everyday as she reads the day’s blessing for teachers on this perpetual calendar. It can be used year after year. 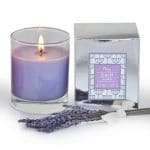 At the end of a long day this lavender aromatherapy candle is just what your child’s teacher needs to promote relaxation. This lovely candle turns her home into a spa and helps her relax and refresh before returning to her classroom the next day. These are some extremely practical gifts for teachers and a Godsend for Type-A personalities. These come as 2in clips with 6 per pack. 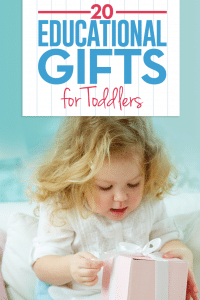 Show your child’s teacher how much you appreciate her with a gift from this list. A great teacher’s gift doesn’t have to break the bank. 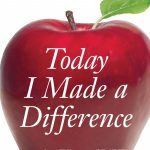 You can be frugal and show your gratitude at the same time even if you are giving a gift to more than one teacher. I am in love with these gifts! I would have loved stuff like this to give when I was in school. I cant wait until my kids are in school so I can give wonderful gifts to their teachers. These are all great ideas. Our teachers do so much for the kids. I think it’s important that we give back to them. 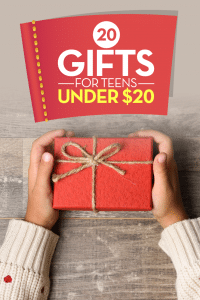 These are some great gift ideas. Teachers don’t want another gift basket of lotions. Classroom supplies are always a hit too. 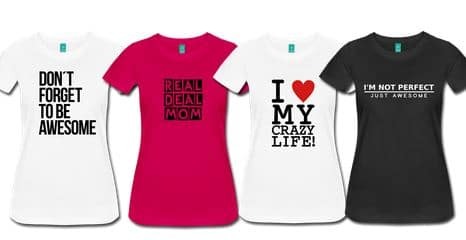 These are all great gift ideas. I always made a small gift basket for my son’s teachers when he was in school. These are some fun ideas. I like the clock personally. These are great ideas! Much better than just gift cards. So thoughtful! These are such great ideas and I love they they are budget friendly. I have sever teacher friends that I know would love some of these! These are all such good ideas! Any teacher would love to receive any of these gifts! 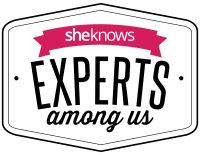 I love this list and how out of the box it is! The last thing I want to do is give my children’s teachers one more bottle of moisturizing lotions and perfume! Can’t wait to go shopping for these gifts for the holiday season! Personally, I love seeing the kids and families getting to use that money for themselves. However, a mug is always my favorite gift. Look realistically teachers do not want apples anymore! 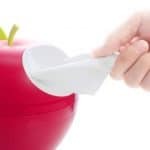 I am so happy we have came a long way from those days of giving apples. 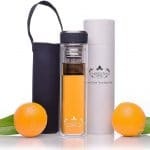 I love the tea infuser bottle or the essential oils diffuser. I have a lot on my list this year and it would be nice to save money on gifts!Thanks for these awesome ideas! I really appreciate that they’re under $20. I like them all. You’ve got some great choices. The initial tote is my favorite though, that’s one my son’s teachere would love. 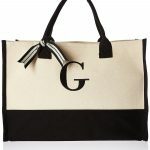 The personalized tote looks super cute and useful. What teacher doesn’t need another bag? Who doesn’t love gifts? Can I have all of these? Not a teacher tho . LOL. Thanks for the ideas. Would definitely share this with my kid. These are great ideas! It’s important that gifts not be too expensive because we have a bunch of teachers to buy for.